AX-52 is a water-soluble corrosion inhibitor developed specifically for water-based magnetic particle suspensions. It provides excellent corrosion inhibition to protect parts and equipment from rusting. When using water as a magnetic particle vehicle, metal parts can be protected from corrosion by using AX-52, which comes as a clear to amber liquid. 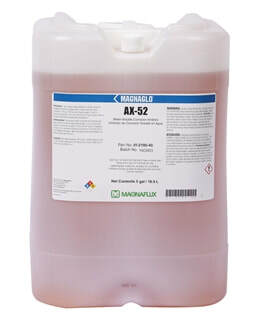 AX-52 dissolves quickly in water, and can be used in all wet method water baths to improve the corrosion protection.